What substrate should I use in recirculating system? Ebb and flow systems and the drip system can be used in combination with a substrate. Most nutrient systems for recirculating systems assume that an inert substrate is used. An inert substrate is a substrate that does not withdraw nutrients from the nutrient solution, nor does it add them. This does not mean it will not affect the pH of the medium, rock wool is an example of an inert medium that does not affect the EC but does raise the pH level. Soil is not an inert substrate, as soil contains nutrients that, if they are also in the nutrient solution, would result in an excess of certain elements. 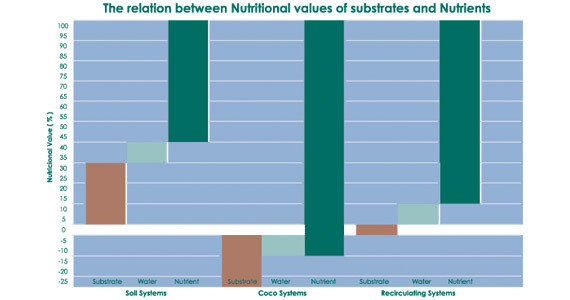 Coco has the opposite effect, withdrawing certain elements from the nutrient solution. If a recirculating nutrient is used in combination with this substrate, it will result in a nutrient deficiency. Clay, perlite and rock wool are examples of inert substrates. These substrates do not contain any nutrients, nor do they withdraw them from the nutrient solution. CANNA Aqua has been specially developed for use on recirculating systems, and its composition is such that the pH remains stable over prolonged periods of time. In addition, CANNA Aqua contains Silicates, humic and fulvic acids, and algae extracts that lead to even better performance. CANNA nutrients have a biotropic effect. They are absorbed naturally by the plant’s biological system and ensure the best possible balance and increased resistance in the plant’s cells. In the initial phase of growth, the basis is laid for an exuberant bloom and yield. A healthy and strong growth is characterized by vital growth spurts and excessive root development. 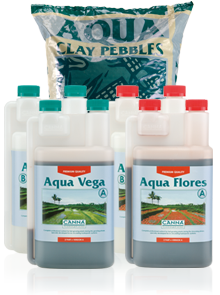 Aqua Vega has been specially developed to meet the plant’s need perfectly. Full absorption of nutrients and water penetration directly from the start of the growth are made possible by Aqua Vega’s large quantities of directly absorbable, high quality, nitrogen elements, top quality EDDHA iron chelates and trace elements. In the plant’s exuberant blooming phase, it is vitally important that all necessary nutrients are available directly and in the right quantities. Aqua Flores stimulates the growth of fruits and contains all necessary elements that are required during the blooming phase. For example, the plant requires less nitrogen during the blooming phase. However, the need for potassium and phosphorous is greater. Aqua Flores is rich in these elements and special chelated trace elements allow direct absorption resulting in a perfect bloom.